Sinn Féin's Martin McGuinness is retiring from politics for health reasons and will not be contesting the Assembly elections on 2 March. 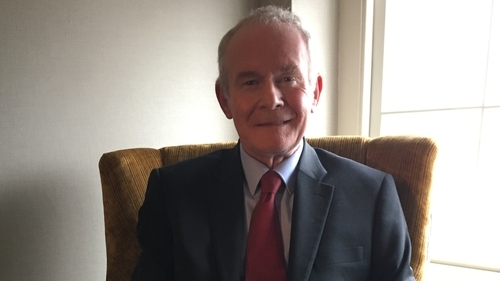 The 66-year-old former deputy first minister, who was once a leading member of the IRA, confirmed his decision in an interview with RTÉ News in his native Derry this afternoon. Mr McGuinness indicated he still believes in the principle of power-sharing and hopes Northern Ireland's institutions can be restored after the March elections. He also said he had intended to retire next May, the tenth anniversary of his entering a power-sharing Executive with the then DUP leader Ian Paisley, but that illness and other recent events had brought forward his decision. Speaking on RTÉ's Six One, Mr McGuinness said he is at the early stages of treatment and is absolutely determined to overcoming the condition and will continue his work for peace and finding ways of making a contribution. 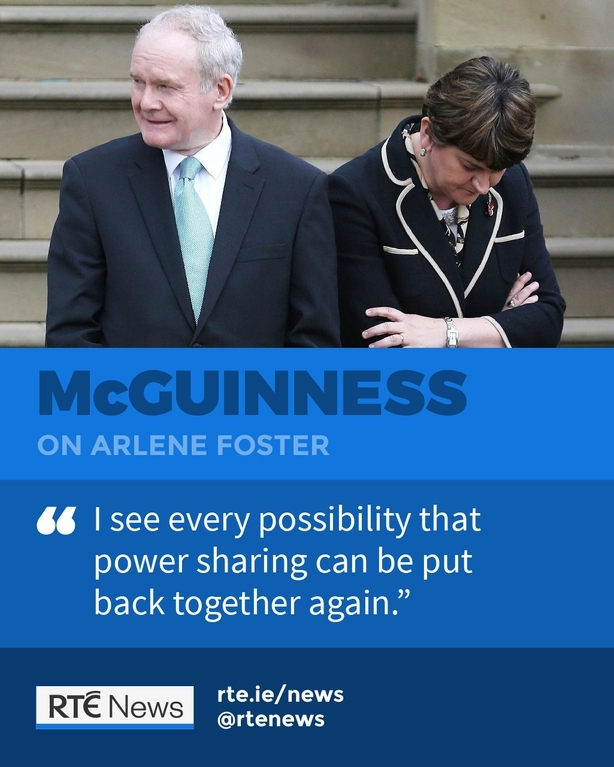 He said he expects Arlene Foster will maintain her position as leader of the DUP following the Assembly elections. But he said had she temporarily stepped aside while the inquiry into the party's handling of a botched energy scheme got under way, it would have negated "all of the nonsense over the last number of weeks". He said he is proud of his achievements and the role he has played over the last 25 years in developing a peace process and hopes he will be judged fairly. In a statement issued earlier, Mr McGuinness said the Northern Ireland "institutions are in a deep crisis as a result of recent events and we are facing into an election when the people will have their say". As the leader of the Sinn Féin grouping at Stormont, Mr McGuinness said a new leader will "lead us into this Assembly election and into the negotiations that will inevitably follow on from that election. "Despite the current difficulties and challenges, I am confident and optimistic about the future. We have faced more difficult times and found a way forward". 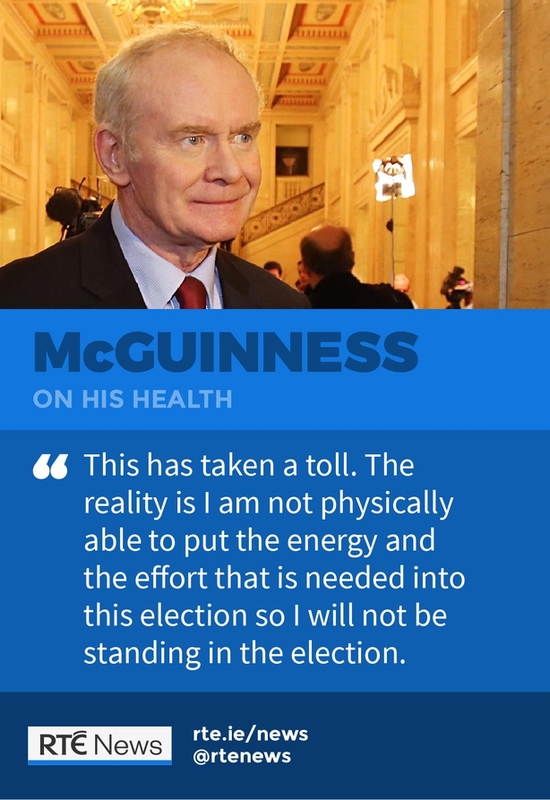 In his statement, Mr McGuinness addressed his health and said he wanted to be open and honest with his friends and colleagues, as well as the electorate of Foyle, and his family and the teams of carers providing him treatment. "Unfortunately, I am not physically able to continue in my current role and have therefore decided to make way for a new leader". Mr McGuinness resigned as Deputy First Minister on 10 January in protest at the Democratic Unionist Party's handling of a botched energy scheme, which led to the collapse of the power-sharing administration. He announced the decision after his partner in government, DUP leader and former first minister Arlene Foster, repeatedly refused to step down to facilitate an inquiry into the Renewable Heat Incentive - a scheme that has left Stormont facing a £490m overspend. 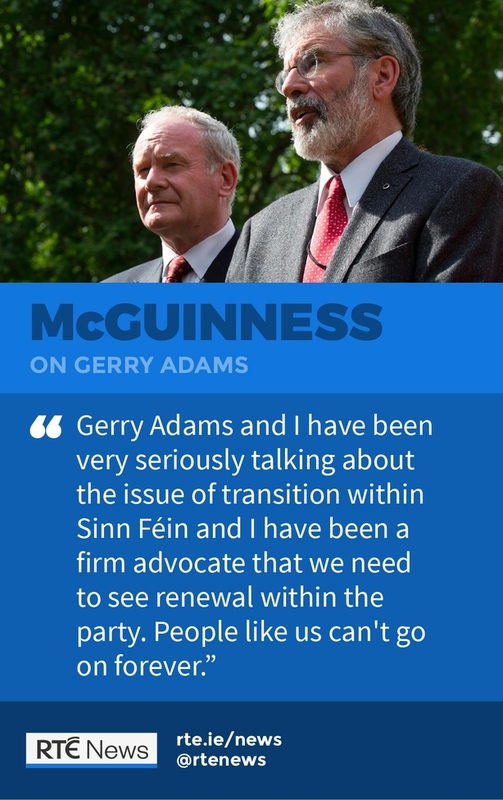 Mr McGuinness also indicated that his decision is the first step in a phase of transition in Sinn Féin and that his replacement leading the party's Stormont campaign will be announced next week. His move today will increase speculation that Sinn Féin leader Gerry Adams may consider stepping aside from the role this year. Mr Adams has paid tribute to his "friend and comrade" who, he said, he first met "over 45 years ago behind the barricades in Free Derry". Mr Adams said that everyone had been shocked by Mr McGuinness's appearance recently but he is since looking a lot better and responding well to treatment. "However, he does need to take time out to get better for himself, for his family and for our struggle". Mr Adams offered Mr McGuinness his best wishes and appealed for space to allow him get better. 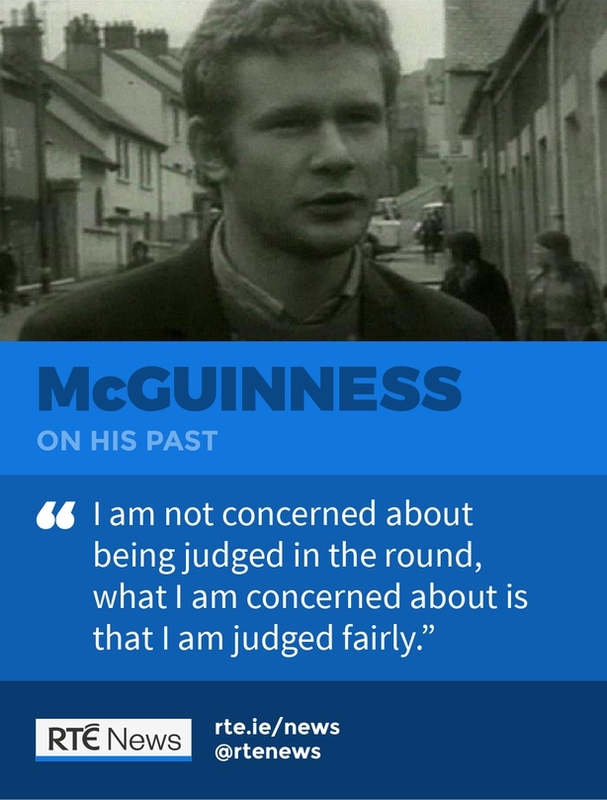 In his statement, Mr McGuinness said he is "deeply proud of the generation of Irish republicans" that came before him and is "privileged to be part of the generation that broke that apartheid state apart and to have been part of a Sinn Féin leadership that delivered peace and radical change. "There are more republicans today than at any time in my generation. "I look across the party north and south and see energy, determination, talent and potential new leaders emerging who, I am confident, will deliver equality, respect and Irish unity".